In my previous post I spoke about the obstacles we all encounter at times in our lives. Today I want to continue with the topic. A lot of the obstacles we get along our journey are ones created by factors outside of our control. However, some obstacles are created by our own doing. One of the biggest self-made obstacles is called Procrastination. 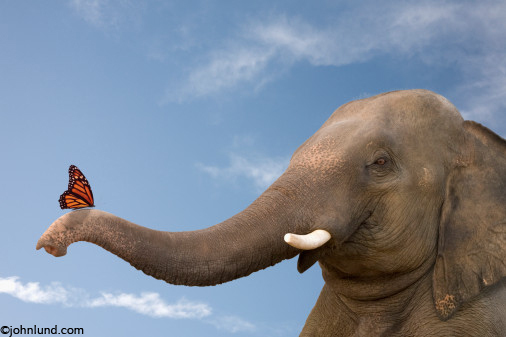 It can start off as a little cuddly animal, but before long it can become a massive elephant in our lives. According to the Etymology Dictionary procrastination comes from Latin procrastinationem (nominative procrastinatio) "a putting off from day to day," noun of action from past participle stem of procrastinare "put off till tomorrow, defer, delay," from pro- "forward" (see pro-) + crastinus "belonging to tomorrow," from cras "tomorrow," of unknown origin. Many people view procrastinators merely as lazy people. And while some procrastinators may appear lazy, the truth of it is not as simple as that. We think that we can "cure" a procrastinator simply by telling him to stop wasting time and to start doing something. Unfortunately, that is as likely to be successful as telling a smoker to stop smoking. It is estimated that 20 % or more of the population are chronic procrastinators. Most people view procrastinators as irritating, but few take it seriously, yet procrastination can have serious consequences for both the procrastinator and those around him. Many people are hindered in their careers and relationships by their procrastinating habits. * They lack commitment to the task or goal. They would like to do it, but they are not committed enough to put their every effort into it. Their desire to achieve it is not strong enough to pursue it. They lack the drive to chase the dream and are therefore easily distracted. Often people fear that if they were to try, they might fail. They feel safer not to try than to try and fail. They fear that failure will only prove to themselves, and others, how useless they are. They feel vulnerable. Sometimes they fear success. Being successful means having to live up to others' expectations of them, and they fear that it would be too daunting for them. * Leaving the comfort zone. All procrastinators like their comfort. They love The Zone. They love dreaming ABOUT doing something. They even love planning HOW to do something. They gather all the information about where, what and how, but they do not like leaving their comfort zone. Leaving the Zone takes effort, it means having TO DO something, and that often goes hand in hand with some form of discomfort, even some pain. Procrastinators feel inadequate. They are unsure of how or where to start a daunting task. They have little or no knowledge about the task at hand. They feel overwhelmed by the whole process. They put off getting started and the result is that the elephant grows larger and larger which leads to further procrastination. It becomes a vicious cycle. * They have no desire to achieve the goal or tackle the task at hand. People who have no, or very little interest in a certain job, will not be very motivated to take it on. Often people find themselves having to live up to other people's ideas of what they should do, but they themselves have no interest in doing it. They will use any excuse as motivation not to do it. WARNING: I know what you are thinking - "I'll do it later." I urge you to DO IT NOW. Follow the link. Get ready to take control of your life. Stop making excuses - NOW! Do what you have been putting off - NOW! Do it every day, even if it is just one step a day, but DO IT!